Networks launch their 4G weapons in the mobile war but which is best for you? 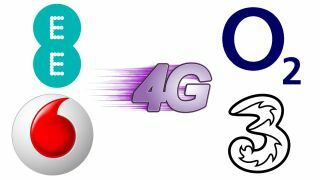 EE is no longer the only 4G operator on the block, with the big blue of O2 and the big red Vodafone networks finally bringing their super fast mobile offerings to the table. With EE being an established network, covering over 60% of the UK population, both networks have a lot of work to do. Three has an even bigger job on its hands, as it won't be launching its 4G service until December which means it will be playing a massive game of catch up. The biggest thing that all of the networks have to worry about is convincing people that 4G is the way to go, since Gary Marshall points out that consumers just don't see the need for 4G. So what do the big three networks have up their sleeves? Here is our run down on what you can expect. Let's face it, 4G is going to be of no use to you if you don't have access to it. EE now has 4G coverage for over 60% of the UK, covering 100 towns and cities across the UK including Birmingham, Bristol, Cardiff, Derby, Edinburgh, Glasgow, Leeds, Liverpool, London, Manchester, Nottingham and Sheffield. 24% of the UK is also eligible for EE's new double speed 4G. O2 launched its 4G service on August 29 2013 in London, Leeds and Bradford and it will cover a total of 13 cities by the end of the year. Vodafone launched on the same day, but only in parts of London, with 12 more UK cities to be covered before the end of 2013. Given Vodafone and O2 share their base stations in a cost-cutting measure, it makes sense that the same 13 cities would roll out at the same time - although Voda might choose to go to with some different locations to offer variety. Three on the other hand will launch its LTE service sometime in December in London, Manchester and Birmingham. A spokesperson told TechRadar its "4G rollout will ramp up from January with 50 cities covered by the end of 2014, and 98% of the population covered by the end of 2015." EE's 24-month 4G plans start at £26pm with 500MB of data, climbing by £5pm for a further 500MB. However at £46pm, a whopping 10GB of data is on offer, climbing to an even larger 20GB for a mind boggling £51pm. For a 12-month contract, prices start at £41pm for 500MB of data, with £66pm gaining you 8GB of data. EE also offers 12-month and rolling 1-month contracts, starting at £21pm and £23pm respectively. All plans come with unlimited calls and texts. Vodafone offers both 12 and 24-month Red 4G plans, again starting at £26pm. These Red plans include unlimited minutes and texts, with varying data limits. Vodafone offers 3 months worth of unlimited data to all new contracts, but Vodafone UK CEO Guy Laurence made it clear that "we won't be going unlimited in the near future. In fact I'm not sure it will go unlimited at all". O2's prices are a little simpler to understand. They all come with unlimited texts and calls, the base price for a SIM only contract on a 12-month deal is £26 for 1GB of data. £31 a month will net you 3GB of data, and £36 will get you 5GB. However, order before 31 October and the latter two tariffs will be bumped up to 5GB and 8GB of data for the whole term of the contract. If you get on O2's Refresh scheme, which sees your monthly payment split into airtime and paying for the phone, you can upgrade anytime you want and simply throw in the remaining balance for the handset. Go down this route and 4G data plans start at £22 for 1GB of data, £27 for 3GB and £32 for 5GB, with the 5GB and 8GB upgrades also on offer. These also come with unlimited texts and calls.